Roll up, fellow candy-asses, His Rockness requires your attention. 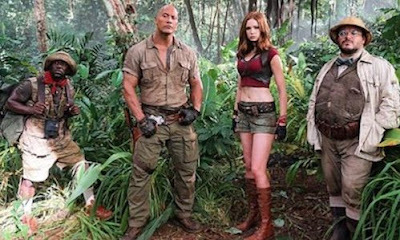 The first picture from his reboot of ‘90s fantasy adventure Jumanji has surfaced via co-star Kevin Hart’s Instagram feed, and, well. Not too much is known about this one yet, except that Dwayne Johnson is playing a character called Dr. Bravestone, it’ll continue on from the 1996 Robin Williams original and, on this evidence, will require a lot more mosquito repellant than that version. Also pictured here at the end of day 1 on set are Hart, Karen Gillan and Jack Black. Because, let’s face it, you’re not making a Jumanji movie without Jack Black. Former Jonas Brother, Nick Jonas is also aboard. Jake Kasden is directing the new film, which is currently working towards a July, 2017 release date.